Chicken Parmesan is incredibly delicious, and we solved the riddle of how to slash excess fat and calories from that dish ages ago. (Click & see.) But since we're always looking for fun ways to enjoy this classic, we present... the finger-food version! Warning: Any nearby children just might lose their minds over these crazy-good ALL-NATURAL chicken fingers. In a wide bowl, combine breadcrumbs, Parm, salt, and pepper. Add 1/2 tsp. Italian seasoning and 1/4 tsp. garlic powder. Mix well. Evenly slice chicken into 10 strips. Place in a large bowl. Top chicken with egg whites, and flip to coat. One at a time, shake chicken strips to remove excess egg and coat with breadcrumb mixture. Evenly lay on the baking sheet. Flip chicken strips. Bake until slightly browned and cooked through, about 8 more minutes. In a small microwave-safe bowl, combine crushed tomatoes with onion powder and remaining 1/4 tsp. each Italian seasoning and garlic powder. Mix well. Microwave for 30 seconds, or until hot. 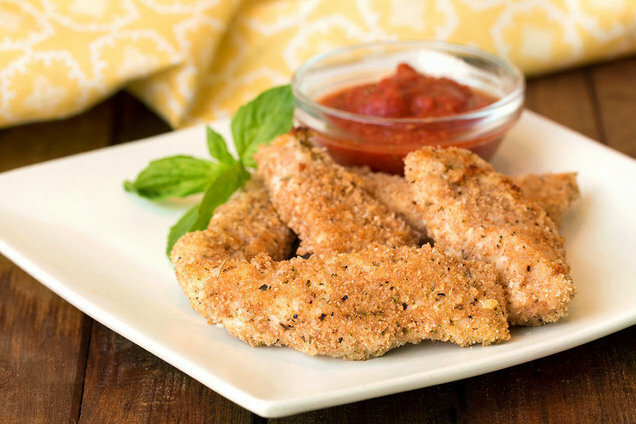 Serve with chicken tenders for dipping. Hungry for More Handheld Chicken Recipes? Today, March 8th, is National Peanut Cluster Day. These Banana Split Bites are topped with clusters of chopped peanuts, and they rule. Everybody will love this recipe, so share it ASAP -- click "Send to a Friend" now!